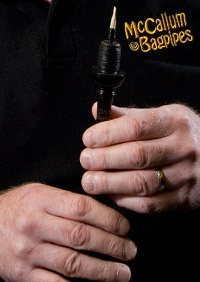 In 2007, McCallum Bagpipes revealed the brand new McCallum Solo Chanter. The chanter was designed and is played by one of the world’s most highly decorated soloists, Willie McCallum and is engineered at our Kilmarnock factory. Every chanter is individually tested by Willie McCallum, so you know it is fit to grace the boards of any prestigious solo competition. Eight times Glenfiddich Piping Championships winner Willie McCallum and precision engineer Stuart McCallum of McCallum Bagpipes combined musical and engineering expertise with their common interest in the pursuit of perfection to develop a winning product in the new McCallum Solo Chanter. After two years of intense development and testing, Willie McCallum retired his own chanter of 20 years and took the first McCallum Solo Chanter into competition at the Lochaber Gathering, winning the ‘A’ Grade March, Strathspey & Reel, Open Senior Hornpipe & Jig and Piobaireachd – a clean sweep of every event entered. The McCallum Solo Chanter is available in a choice of African Blackwood or Polypenco from your local McCallum Bagpipes dealer or direct from Willie McCallum Piping. How Good Does it Sound? You need Adobe Flash Player to view this video. You can watch more videos featuring the McCallum Solo Chanter on our YouTube channel. 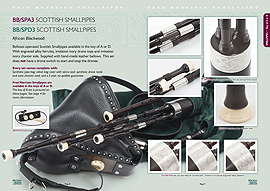 To find out more about the McCallum Solo Chanter, we invite you to view our full colour digital brochure. Please contact us for further information on the McCallum Solo Chanter.